say “No” to Israeli exploits, lies and conspiracies. to refuse adamantly participation in peace talks or negotiations for the sake of talks. to resist arm-twisting from friend and foe alike, especially when the vital interests of our people are at stake. to be honest and straight forwardly frank with our people. to have Plan-B in case it becomes crystal clear that peace with Israel is an illusion, a truth that only fools and imbeciles don’t see. to refuse adamantly participation in reconciliation for the sake of talks. to have Plan-B in case it becomes crystal clear that reconciliation with Abass is an illusion, a truth that only fools and imbeciles don’t see. Khalid ignored to tell his readers what is the Plan-B he expects from Abass. Declare that Abass, his PA, his security forces are traitors and deal with them in WB the same way Hezbollah dealt with Saad Hadad, Lahd and their Lebanese southern army. Declare a Palestinian state in Gaza, and demand their brothers in Egypt, Tunis, Libya, and Maghreb to recognize that state. Demand breaking the siege on Gaza. This is the Minimum thing expected from Egypt brother towards their brothers in Gaza. A third meeting between Israeli and Palestinian Authority (PA) officials in Amman has ended without results or, more correctly, without progress. The two other previous meetings also met the same fate. A fourth meeting is reportedly planned for next week, which suggests that the PA leadership has not completely lost faith in the essentially futile talks which have been going on for years with no sign that the apartheid Israeli regime is willing to give up the spoils of the 1967 war. Far from that, the Zionist regime is slowly but definitely liquidating the Palestinian cause and by making the creation of a real Palestinian state on the West Bank utterly unrealistic if not outright impossible. Needless to say, under the rubric of “peace talks” and “negotiations,” Israel has been busy creating facts on the ground all over the West Bank and East Jerusalem, stealing more Palestinian land, demolishing more Palestinian homes, vandalizing Palestinian groves and, of course, building and expanding Jewish colonies. Palestinian negotiators tried so hard to gain the status of “equal partner” vis-à-vis Israel. However, thanks to Israeli intransigence and arrogance of power, Israel never treated Palestinian negotiators more than they deserved (from the Israeli view point), namely that the Palestinians are vanquished supplicants, begging Israel for the oxygen of life. This disgraceful treatment manifested itself this week when the Israeli occupation authorities withdrew “VIP” treatment from AP Chairman Mahmoud Abbas. The deliberate and humiliating measure, which would limit to the minimum Abbas’s freedom of movement, including his ability to travel within the occupied territories, epitomizes PA subservience, dependence on Israel. Such platitudes have been heard ad nauseam from the PLO Chairman ever since he succeeded the late Palestinian leader Yasser Arafat. But the Palestinian leader seems out of touch with certain realities. First, he doesn’t realize that holding successive meetings with Israel, even under Jordanian stewardship and even under the misleading title of “talks” rather than “negotiations,” constitutes a serious concession and retreat for the Palestinians and their just cause. Indeed, PA officials, including Abbas, never missed an opportunity to stress and swear they wouldn’t agree under any circumstances to resume peace talks with the Zionist entity as long as the latter didn’t agree to freeze settlement expansion. Israel, of course, never agreed to freeze settlement expansion. The opposite is true, as the current Israeli government, arguably the most hawkish and Nazi-like ever since the creation of the criminal entity, embarked on a frantic and phenomenal settlement expansion drive encompassing the entirety of the West Bank. As to East Jerusalem, the contemplated capital of the contemplated Palestinian state, Israel has effectively completed the Judaizing process as the process of seizing Arab homes and property and handing them over to Jewish land thieves continues unabated. Second, there is no doubt that Israel is using meetings with the PA, direct or indirect, to give the world, especially the international Quartet, a false impression that peace talks are underway and that there is no point in putting pressure on Israel at least in the duration of talks. And it seems the Zionist regime has effectively succeeded in this effort, with the Europeans and especially Americans refusing to chide Zionist officials in spite of the phenomenal settlement aggrandizement and other unmitigated measures aimed at narrowing Palestinian horizons and decapitating whatever possibility there still is for the establishment of a viable Palestinian state. According to the Ynet news.com, Israel continued its efforts to strip the PA politically naked by demanding that the ongoing talks in Amman be considered formal negotiations than just talks. True, the PA is resisting the Israeli ruse, but observers are prompted to ask what differences are there between protracted talks and negotiations when a second, third and fourth meetings are planned to take place and when fundamental contentious issues are discussed.? It is also true that the PA position is pathetically weak, especially in the face of the Zionist entity which tightly controls the policies and politics of the United States, Israel’s ultimate guardian-ally and bankroller. However, the PA should have understood a long time ago that linking the Palestinian cause, including negotiations with Israel, to the American-Israeli equation is a colossal disaster. Thus, keeping up this repugnant modus operandi, whereby Israel continues to carve and devour more and more Palestinian land while the PA continues to indulge in pointless and fruitless talks with Israel, during which the same arguments are made and same platitudes are repeated, can only mean one thing, namely the end of Palestinian dreams for establishing a viable and territorially contiguous Palestinian state. No Palestinian, or Arab or Muslim expects Chairman Abbas to transform himself into another Salahuddin (Saladin). However, all Palestinians do expect Abbas to say “No” to Israeli exploits, lies and conspiracies. Failing to do so would only imprint an indelible blot of disgrace on the entire PA regime. 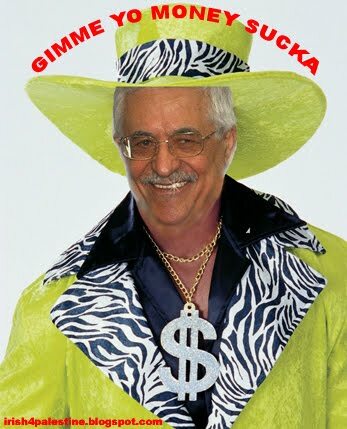 We expect Abbas to refuse adamantly participation in peace talks or negotiations for the sake of talks. We expect Abbas to resist arm-twisting from friend and foe alike, especially when the vital interests of our people are at stake. We also expect Abbas to be honest and straightforwardly frank with our people. Above all, we expect the Palestinian leadership to have Plan-B in case it becomes crystal clear that peace with Israel is an illusion, a truth that only fools and imbeciles don’t see. The lamentable fact is that the PA doesn’t possess such a plan, which really makes every honest person seethe with anger at that leadership.